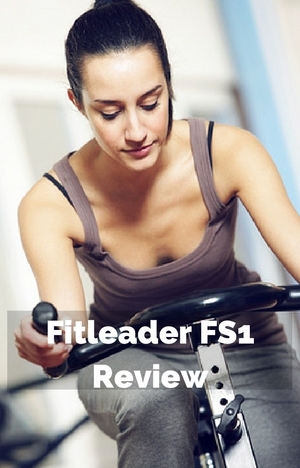 When I first saw the Fitleader FS1 I admit I dismissed it. I thought it wouldn’t be up to the job for indoor cycling or spinning type workouts. But it seems I might just be wrong. It includes magnetic resistance which is unusual for indoor cycles or spin bikes in this price range especially. It also has a console, water bottle holder, fully adjustable seat and vertically adjustable seat to give bike that fits you properly for an effective cardio workouts. In my review look at how this bike lives up to the promise of the positive reviews which leads you to believe it is more than price – as people don’t leave good ratings if they’re left with the feeling you get what you pay for. The stabilizer bars and frame are made of steel which holds steady as you workout in and out of the saddle or when transitioning. There is no flexing or moving around. It seems to be very solid and you get a stable platform for a hard workout if you want or an easier one too. There are leveling feet under the stabilizer bars to level up the bike to stop any rocking due floor variation. The bike has a one year warranty which is longer than other warranties for this price range of bike. Customer feedback suggests the bike will be durable as they say it is well built. There hasn’t been anyone report who has had it for over a year. But the signs are positive. According to the supplier the bike seat can be adjusted to fit people between the heights of 5 ft 1 ins and 6 ft 2ins. But there are some customers who say it is better for people up to 5 ft 10 ins to get a proper riding fit with the leg slightly bent a full extension. Making the adjustments needed is quick to do and using the standard methods for these bikes. They use an adjustment knob with pull pins and pre-set holes in the adjustment poles. You can adjust the seat height and it’s horizontal position. The handlebars height can be adjusted. For many people this can provide the adjustment needed to get the most effective and proper fit for legs and torso. However, the lack of horizontal adjustment can cause those with shorter or longer torsos to feel they have to stretch or are a little cramped. To get this type of adjustment does cost more. It takes about 30 seconds at most to make the adjustments to the bike once you’ve played with it to get it right the first time especially if you mark the poles as to where you want it set for you – this is if someone has moved it since you used it. It won’t really get in the way of getting on the bike and working out whenever you want to or anyone else for that matter – so it can be easily set up for multiple users. You do need to make sure you have the knobs fully tightened up to prevent the seat and handlebars moving around as you exercise. The magnetic resistance is controlled by a lever on the top of the frame. It has 8 levels of resistance marked on the lever. It moves a set of magnets closer and further away from the flywheel. Not everyone is a fan of magnetic resistance as it is a different feel to what you get with a friction pad. But it does give a good consistent level of resistance and doesn’t give that feeling you get with friction pads sometimes that you are pedaling with the brake on. There seems to be a good range of resistance to give many a good workout with it ranging from 100 watts to 600 watts or from easy to hard – which should provide the challenge for all but the most seasoned exercisers. It does go up in increments but there is quite a noticeable difference between each level. It does move up smoothly so there is no sudden jerks up or down. It is quiet and doesn’t require replacing like you have with resistance pads. You can see on the resistance lever mechanism the level of resistance you have set it at which is useful for returning to a previous objectively rather than leaving it to feel as you have with most spin bikes. It comes with a belt drive which provides a smooth and very quiet riding motion. You won’t need to do any day to day maintenance as you would with a chain drive. However, at some stage in the future it will stretch (as with all belt drives – this is usually in years) and need replacing and this requires specialist knowledge skills unlike the chain drive. It is in a guard which helps to reduce damage to the chain as well as protect your ankles as well as children and pets. The flywheel at 13.2 lbs is light for this type of bike but it is perimeter weighted which helps provide more inertia to keep the wheel and pedals moving at the higher resistance levels. The pedaling motion is relatively smooth but you will need to concentrate on your pedal stroke to ensure you don’t find that you end up with more of an up/down stroke rather than a 360 degree motion especially as you increase the resistance. It has a fixed gear so you can’t freewheel or coast – when the flywheel is turning so are the pedals. It isn’t that heavy flywheel so the inertia of it is less so it won’t carry the pedals through as hard or as long but you still need to be careful when stopping not to injure yourself. To stop the wheel and pedals quicker you can move the resistance up to 8.However, there isn’t an emergency brake to stop it fast. The pedals screw into a heavy duty crank so you won’t have any flexing or slipping as you pedal in or out of the seat. The pedals are good size and come with straps and toe cages which can be adjusted for your foot size to keep your foot in place and allow you push and pull through the stroke. The Q factor (the horizontal distance between the pedals) is 9 inches which is wide and you may find it uncomfortable with your feet that far apart and it can put a strain on your joints as the legs aren’t aligned as they would be when walking or on a road bike. Seat. It is larger than a standard bike seat – it is also cushioned and shaped. You may find it provides you with the comfort you want as noted in a number of reviews. However, you may not be that lucky. That is just the way it is with bike seats – it is such a personal thing there isn’t a seat that is right for everyone. Fortunately there are a few things you can try. You can try padded bike shorts or a gel seat cover. Or if that doesn’t work you can swap it out for a standard fitting bike seat that is more to your liking. Handlebars. The handlebars are just bullhorns and don’t have the central bars or loop for the central grips or aero position. Also in the handlebars, are the hand pulse sensors. The handlebars are covered to help to give a good secure grip when your hands get sweaty and prevent blisters after holding them for awhile. Also, if you do lean on them you are likely to find they ache and hurt after short while. Noise. It is a fairly quiet bike so you can use it without disturbing others in the next room – with only a quiet whisper coming from the bike as it operates. You’ll be able to workout with the TV on or when others sleeping so you can fit your exercising around your schedule not the other way around. People who live in apartments should find it more than quiet enough to avoid upsetting their neighbors. If you put it on a rubber exercise mat should be enough to stop anything been heard below. Cleaning. This isn’t going to be too much work due to using the bike. It does require wiping down to stop sweat from starting to corrode the bike and jamming up the moving parts. The sweat can also damage the floor underneath the bike over time too. The best answer to this is to put the bike on a rubber exercise mat. When not in use the bike needs an area of 25.3 by 38.8 ins so won’t fit easily in a closet. You are likely need to set it against a wall. It looks pretty good I think and it will be there to remind you to use it if you need that! There is a set of transport wheels on the front stabilizer bar that you tip bike on to when you want to move it. Tipping the bike on to them is easy to do as is moving the bike. It can be done by one person as most weight is at the front and supported by the wheels. This leaves you to navigate the bike to where you want to go. They work well on all surfaces except very soft carpet where you may find they jam and you have to drag the bike. Also on wood floors they may scratch or dent it, so it’s a good idea to check this out before you move all the way across the floor. The bike comes partly assembled when delivered. Putting it together is straightforward and can be done with an hour or two. some can get this done in half an hour. The instructions included are okay as are the tools – you might find it easier if you have your own but they aren’t necessary. To make it even easier all the parts are numbered to correspond with the steps so there isn’t too much sorting and possibly measuring that you can sometimes get when assembling items. You are required to add the stabilizer bars, adjustment poles, handlebars, pedals, seat and console to the frame and drive. The console is basic but gives you the feedback needed to help to keep you on track. It tracks time, speed, distance, calories burned, ODO, RPM and hand pulse (when sensors are gripped). Distance is measured in kilometers rather than miles and can’t be changed. The display is small but large enough so that you can see the measures clearly in good light. It’s not backlit so you may struggle to read when light conditions aren’t the best. The fact that it measures RPM is a bonus for those that struggle with keeping up with counting or keeping up with the beat of music of spinning DVDs. That’s me I like to have something external to help me with this. The measures can be set to scan or you can set it to view one measure using the mode key under the display. To power the console it take 4 AA batteries. This is all the power needed for it. You don’t need the console to be working to use the bike as resistance is manually adjusted using the lever and not the console. To start the console you press the mode button or start pedaling. It turns off automatically after 4 minutes to conserve the battery. The pulse sensors are at the end of the handlebar bullhorns. You need to grip both to get a reading on the monitor. If you take one hand off them you lose your reading. So, if you want to use heart rate for your workouts you have to stay with your hands in one place or just take it periodically. Also, with these type of sensors on any bike including more expensive ones people find that it is hard to get a reliable reading. It can be due to your hand being too wet, too dry and so on. Some do get them to work but it is hit and miss for most people. If you want to use heart rate for training purposes you are better to do this separately with a heart rate strap and monitor. The console doesn’t provide any pre-set programs or a way to upload your workouts to a fitness account which is normal for consoles on spin bikes and indoor cycles when included. The only ones that do have this do cost a few hundred dollars and more. You’ll need to come up with your own workouts and record the workouts manually if you want to track your progress. The water bottle holder is on the frame which puts in easy reach as you cycle. It is good for smaller bottles but won’t fit large bottles. You may find that is gets sweat on it as it is in a sweat zone. Also, you may find that you bang it with your legs and need to avoid it as you get on and off the bike. On the console it has a shelf for your tablet or smartphone or Mp3 player to rest on for use while you workout. There isn’t anywhere to plug it into to charge or speakers but you can watch or use with headphones. They do stay in place so won’t fall off as you workout. You won’t be able to see your measures as they will be hidden behind your media players. It is likely you may end up dropping lots of sweat on it if you are tall. This is what surprised me when I came to take another look was the ratings given by customers in their reviews. 84% rated the bike a 4 or 5. Those that have rated it lower have had issues with the bike breaking or not working correctly. They don’t seem to have contacted the supplier and the supplier has reached out to them in most cases. And one review has identified a possible issue with the tension lever location resulting in it being damaged and only lasting a couple of hears because of that (could be issue) – no one else has identified this as an issue (and it may be a real issue but only time will tell!). But by far most customers are very happy with the bike and say it offers very good value for the price. They feel they can get a challenging workout on a bike that feels solid and stable. They also like how very quiet it is so they can workout anytime they want. For the price this offers a number of features you don’t normally get in thie price range – a basic console, belt drive and magnetic resistance. Usually you have to pay hundreds extra to get these features. When I checked at Amazon it qualified for Prime and free shipping. The Fitleader FS1 makes a good bike for beginners and those who are ready for challenging workouts. It comes with a basic console that includes RPM (as well as others)which is great for keeping on track when following spinning workouts. Health & Fitness models but coming with both a belt drive and magnetic resistance at an affordable price. For the price you get a good stable, quiet and smooth cardio workout. It is a bike that can be used by all the adult members of the family. It can help you get in and stay in shape at home out of the weather and not having to struggle to the gym.